Our own spin on an Easter egg hunt. I’m not one who is overly knowledgeable about the whole Easter thing but I do love a good treasure hunt (pirates rule) and the kids like nothing more than having a challenge (that and the chance to get loads of chocolate goodies) and for the past few years I’ve spent a day or two before Easter creating these treasure maps. It’s about the four or fifth year that I’ve gone all out with the effort, but its only been since last year that we’ve saved the old map and so I started creating a them as volumes. Volume 1 last years had to be updated because of some of the minor changes around the house, but mostly Josh said it was too hard in parts, especial as he had to workout word searches and cryptic clues. So along comes Volume 2 – Enchiridion Chartis (The Guide Book of Maps, we like Adventure time in this house) and I just made it as hard if not harder than last time with even more clues and puzzles find and figure out. I also added in a games master a.k.a me with some prerecorded video messages. Anyway the kids had a whale of a time and it kept them busy for over and hour, below are just a few highlight pictures of the fun they had. Every now and then we as a family like to sit down and just doodle, when Eves saw my old little mermaid Mona picture she decided to get her coloured crayons and stickers out and have a crack at the her own version. I love all the bright colours in her under sea land, but I’m not sure how the bunnies are gonna feel living under water, maybe they’ll adapt like Sandy on Sponge bob and just wear fish balls for hats. It’s Hans Christian Andersen birthday today as well as my own and I’d just found in the old archives of my comic works the Molly and Mona little mermaid front cover art. Such wonderful things around you. The Movie seems to be a little bit chirpier than the book but sometimes you need the dark side with the bright to help make a clear choice on your own. I’m having a crack at making a computer game with my son Josh and his own comic character Piza the Pizza slice, it has been fun and a bit of a steep learning curve for us both. My skills with the software are basic (…ly nothing) and Josh’s patience on animating character assets and game metrics means I can’t move fast enough. But we are still loving the challenge. Mc Maz in the hizouse, ready to drop some bad (breath) licks and howel out the crazy cats in the neighbourhood dog. Bone breaking forever! I didn’t think a Bassett hound could look anymore miserable. 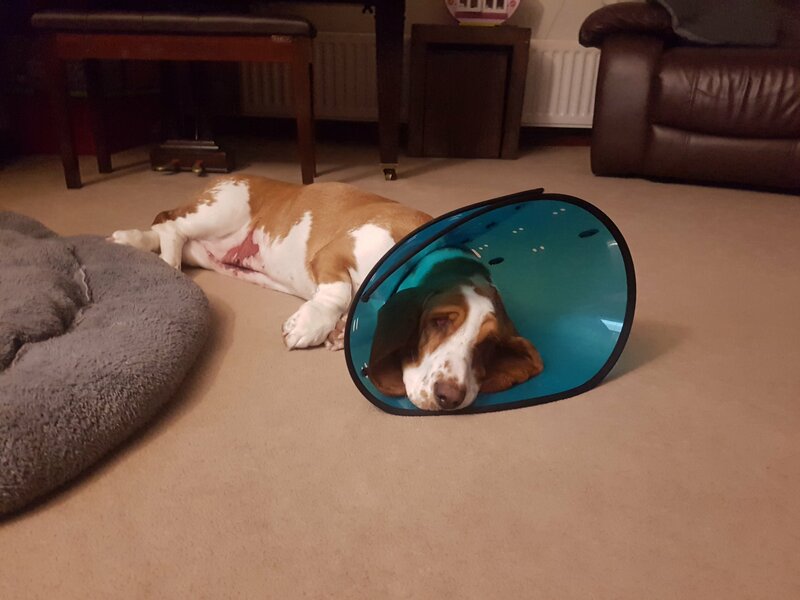 Poor little princess pooch having to wear her lamp shade. I think she’d of preferred it in pink instead of blue. My little lady is doing so well in the world at large, shes top of the class (in my heart at least). Both her and her big bother are just awesome mini people to spend all of my free time with and they help make my humdrum existence a little more special. All the conversations that we have about there ideas and views help me realise that anything which feels overbearing and oppressive in the daily grind has no place in this space. Back to the twirling princess its been a while since I’ve done anything on my site (I guess the holidays kinda filled up my timetable). So now that I’ve had two minutes in finishing it I’ve concluded that its been inspired by watching my personal princess at her dance recital just before my schedule filling up. Recently I’ve been to a birthday party unlike any-other I’ve attended in my life time because the party wasn’t going to be at a swimming pool or feature a bouncy castle or even have a nerf war going on like most I seem to get dragged along to these days. Also it wasn’t filled with hundreds of small sugared up little kiddielings (there were some), Oh no the special someone who’s party it was wasn’t celebrating a single digit birthday or even a double digit birthday, she was celebrating a triple digit birthday. My Nana Margret is a very special lady to me. I remember when I was a little sprog and didn’t eat me school dins, she had an idea for how to feed me her home made grub. The school was only a stone’s throw away from her flat (which was above my parent’s shop) she’d make me dinner every day as long as I walked to the shop without messing around (different time kids could walk the streets home without some news story screaming of neglectful parents or schools). This changed things for me because my nans cooking was and still is legendary especially her meat and tattie pie that she’d make for her grand kids which would be tailor made for their individual tastes with their initials on top. I always thought I was keeping her company but she, it seems was always looking out for me. Her flat was great for my dinners, I could eat my lovely meals in peace and when I finished I could just in so see the playing field from her veranda. This gave me the heads up on (spying on) my mates because I could see if they’d finish their dinners then I could see them and walk back around to play (great times), but other times if I’d had a rough morning (or it was raining) I could just sit with her and feel looked after. Anyway this party that she had, gathered all her family together to reminisce about all the good times that we’ve all had with her, all the first meetings, Sunday dinners, little tuts when you’ve changes your hair style or gotten an ear piercing and all the warm hugs that she gave out. Everyone had only good things to say about her and the hundred years she has been leaving her mark on the world and the people in her life. I love the women who helped bring me up, she was always around to talk too and helping look after us, because my parents had a busy life with the shop open 7 days a week. She was the one around helping my mum and dad out with keeping an eye on my brothers and me while other helped them in the shop. Anyway, she is one hell of a hundred-year-old woman. Take two… or three… maybe more? Starting again with my arty stuff because of outsider influences (namely my son Josh) not in a bad way its more wanting to better myself so that I can help out my children and be a more positive role-model for them. So I’ve been watching loads of other cartoonists showing off there tricks and tips on youtube, tumblr and other net forums. Helping guiding other wanna be’s like me with cheat sheets and methods, I’m hoping for something like an old game cheat code that I could just type in to my digital art package (like up, down, left, right, A, B, Start – it hasn’t worked yet, nope not even an extra 1up) which would help me out. What I did learn from all that content is that every one of those artists may have their own take on what’s important, but have lots of over lapping idea’s, with a lot of hours put in making a firm foundation in their chosen areas. All that skill makes it look natural and simple when watching but frustrating as heck in practice. But don’t give up if you wanna succeed, there isn’t a lot worth doing in this world that doesn’t involved a bit of hard work, but the feeling you get after putting in that effort lasts longer and your skill sets grow stronger with the struggle. This brought me to the realisation, take what you need from others tuition, listen to everyone’s thinking/views and give new methods ago. It may be contradicting opinion’s but if you don’t try you’ll never truly expand you understanding, don’t just clam up and mumble in your own head or even leave slaggy comments like some flabby, broken, decrepit, nocturnal, sweaty, media troll that believes their voices is the only one that matters (don’t trump others dreams) and doesn’t want others to succeed because they wont try. No matter what your age everyone can learn something new. and the idea that came to him was that if you could make Doc Oc’s tentacles automated automatons they could become handy helper travelling around on their own and I bet Doc Oc might win once without even lifting a single appendage. Josh always seems to gravitate towards the villains of comic books, it’s got to be something to do with the fact that they seem to be more interesting and have more fun in their roles. It could also be that most evil doers don’t need/have magic powers to make them super they just use their grey matter. Or it might just be that he found Maisy chewing on he’s toys again and he thinks of her as being the heroin to all of the kids’ games, which would make him have to be the felonious villain coming up with all the story arcs. After a hard day at work I came home to my loving family. The Wifey, trying to hold the house together, Evelyn with her sore ear (which she got from all the swimming she’d been doing on her hol’s and Josh my big lad who may not be as old as he thinks he is. I found this out when I made the mistake if showing him the movie trailer for Venom (he is a big fan of the cartoon character) this was a bit to realistic and I’ve probably scared him for life. After the kids went to bed that same night, Rach and I had a gas about our childhood movie experiences and which movies scared us. Mine were films like I.T. and Chucky but apparently E.T. freaked out Wifey. When looking at images on google of him to refresh my memory he does look like an old body part that’s been in a warm bath (of bleach) to long. I decided to paint a little pic of our late Moe with help from my daughter Evelyn. Good Night My Princess Pooch. To people who do not have pets or allow themselves to connect emotionally with another creature, for the short space of time we have on this spinning rock that is hurtling through eternity. It is just a short message saying that even though you are not walking by my side anymore, you will always be in my heart. I may have hung your lead and collar up for the last time, but the walks we have taken over the many years of your life will never leave me. It was not always easy having a smelly, stubborn, moody, noise but loving best friend like you, but we will always make exceptions for love and happiness, which you brought into my life every day. You arrived shortly after the beginning of my relationship with my wife, you came to my wedding as a brides maid, you were there when I brought home my son into the pack, you were there when we moved house, you were there when I brought home my daughter as well and you were there when we got Maizy someone who helped give you a new (if not short lived) lease of life.